during the last couple of days i've come across many blog posts and tweets about people sharing their word they chose for 2014. i've always liked the concept of this, a word guiding you through the year, a gentle nudge, a day-to-day reminder to keep up with or work on something without actually having to stick to a (sometimes) rigid resolution. i've had words i chose in the past (balance, mindful and rhythm), but skipped the last 2 years for whatever reason. "Adventure isn't all about climbing mountains or rowing oceans. Adventure, in it's purest form, is simply a way of thinking." 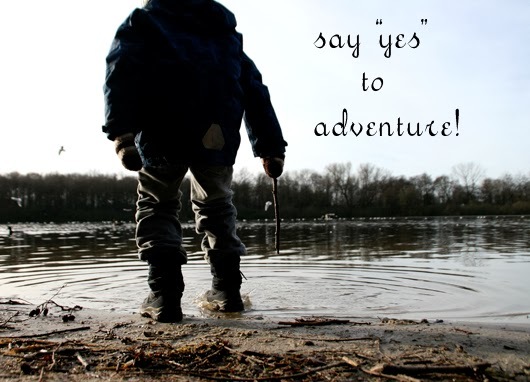 this year, i will say "yes" to adventure! loved visiting and reading your enthusiasm to saying yes. This is going to be a fun year, isn't it? ?